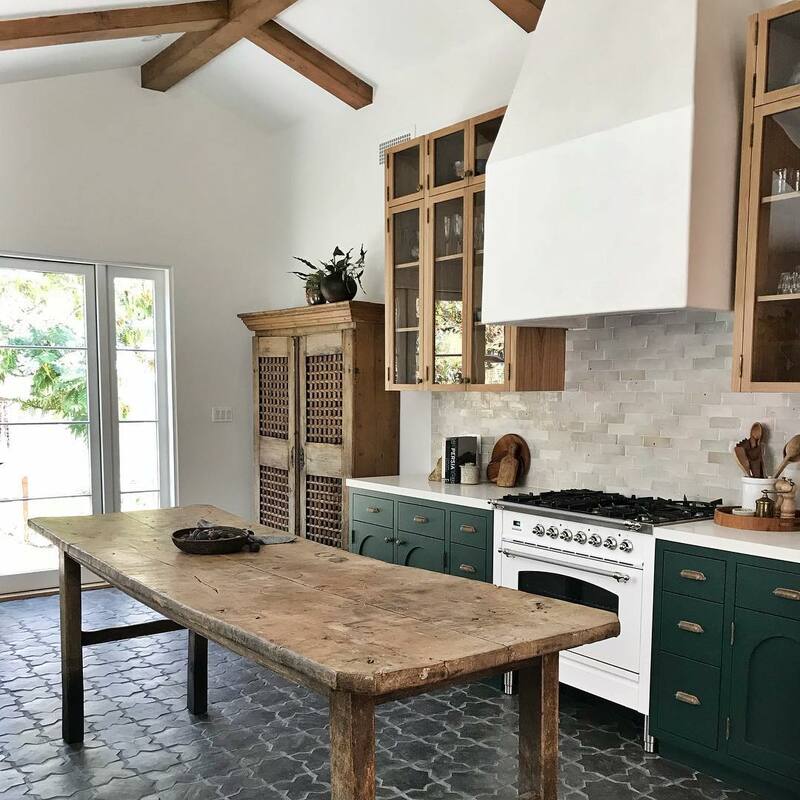 Farmhouse home decor is an immensely popular decorating style right now which means it’s easier than ever to find farmhouse decor ideas and inspiration. 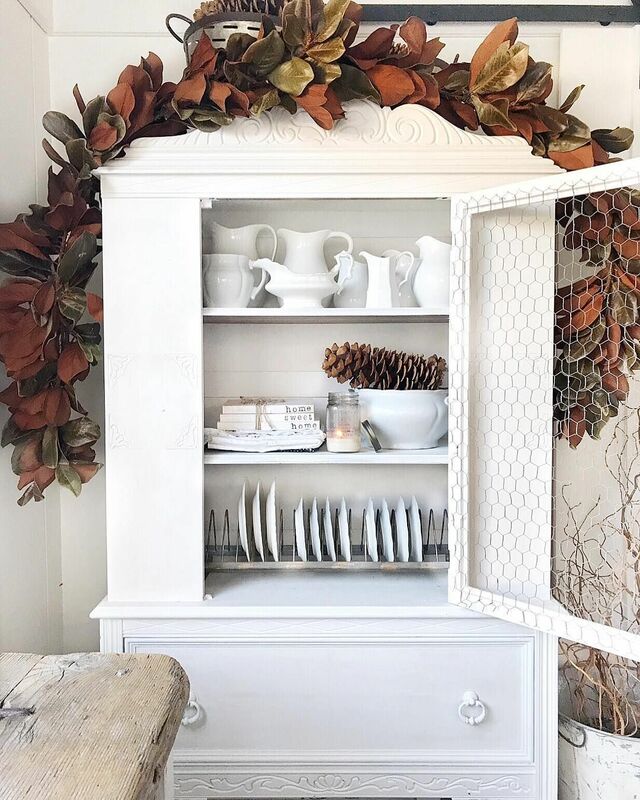 I hope this post will help you sort through the different Farmhouse decor ideas and determine what’s right for your home and your style! What is Farmhouse Style Decor? Farmhouse decor is warm, inviting and cozy. The color scheme tends to feature lots of whites, ivories and neutrals, and any colors added are typically faded, not bright, to give a worn-in look to the home. Furniture is often “distressed” either naturally or intentionally! Vintage, antique market, and country-style decor accessories are often added sparingly. Farmhouse style decorating is charming and imperfect. Think: natural wood furniture, apron sinks, and lightly peeling paint. Using sliding barn doors on the interior of your home is a classic Farmhouse style decor move! Whether you leave the doors a rustic natural wood style, or paint them with a certain finish, sliding barn doors are a great way to add some farmhouse charm to your home. You would need to purchase the sliding track to go above your doorway, but this style has become so popular that you can easily find a barn door and track combination at many retailers. Another option is to purchase double barn sliding doors which slide out and easily create a space division. Sliding barn doors are very practical because they can easily divide and open spaces without taking up a lot of space the way that a typical swinging door would. I love this farmhouse idea! 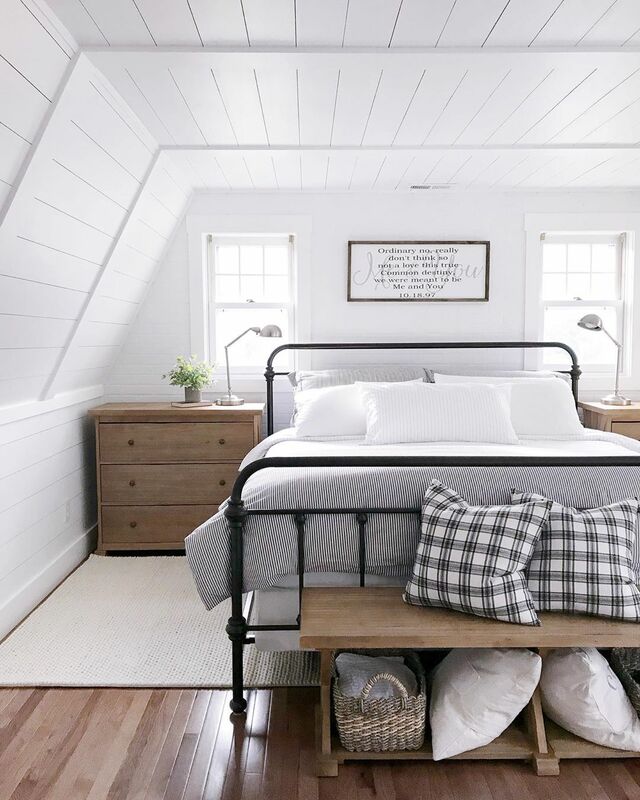 Shiplap is a quintessential farmhouse style look for your interior walls. Shiplap refers to the horizontal panels of wood that are about 6-8 inches wide, each. They typically were used to make ships which is where the name comes from! You can do walls, ceilings or just accent walls with shiplap wood. 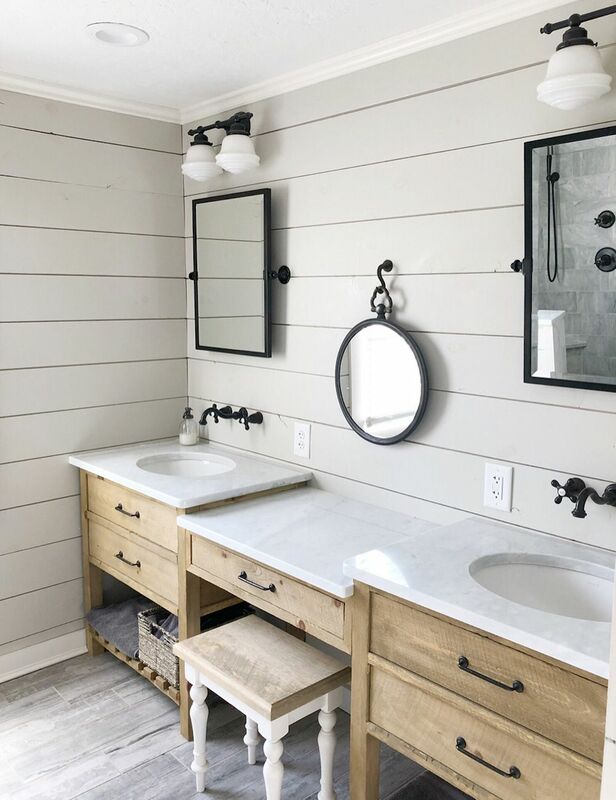 You can get nice, white-washed shiplap boards like these from your local Home Depot! Chicken wire is an easy and affordable way to add some Farmhouse touches to your home. Chicken wire is typically used on farms to fence in chickens and other small animals. It’s made with thin strips of wire that are formed in a hexagonal pattern. There are so many decorative accents you can find online that are made with chicken wire! Here are a few ideas. A key element of a farmhouse style home is distressed decor. Distressed decorating just makes things look a bit older and worn-in. Nearly everything inside a farmhouse home can be distressed: from curtain rods to lamps to furniture! If you watch Fixer Upper, you’ll notice that Joanna Gaines actually walks through her homes and manually distresses objects as a finishing touch! If you want to distress your own furniture you can use any old sandpaper to reveal the base material beneath any painted or finished surfaces. You can also purchase pre-distressed furniture and decor like this lightly distressed rustic wall arch. Whitewashed furniture is a popular finish on farmhouse home furniture. You can spot a whitewashed piece by its slightly transparent white finish. The gentle white coloring doesn’t overwhelm the natural brown wood grains beneath giving the piece a brownish white surface color. You can easily whitewash furniture yourself by grabbing a paint brush and white acrylic paint. From there, you water down the paint using a 2:1 ratio of paint to water. Gently paint your piece of furniture with the mixture, occasionally using a rag to remove any excess paint. After letting it cure for 2 days, seal the piece with your favorite furniture wax! 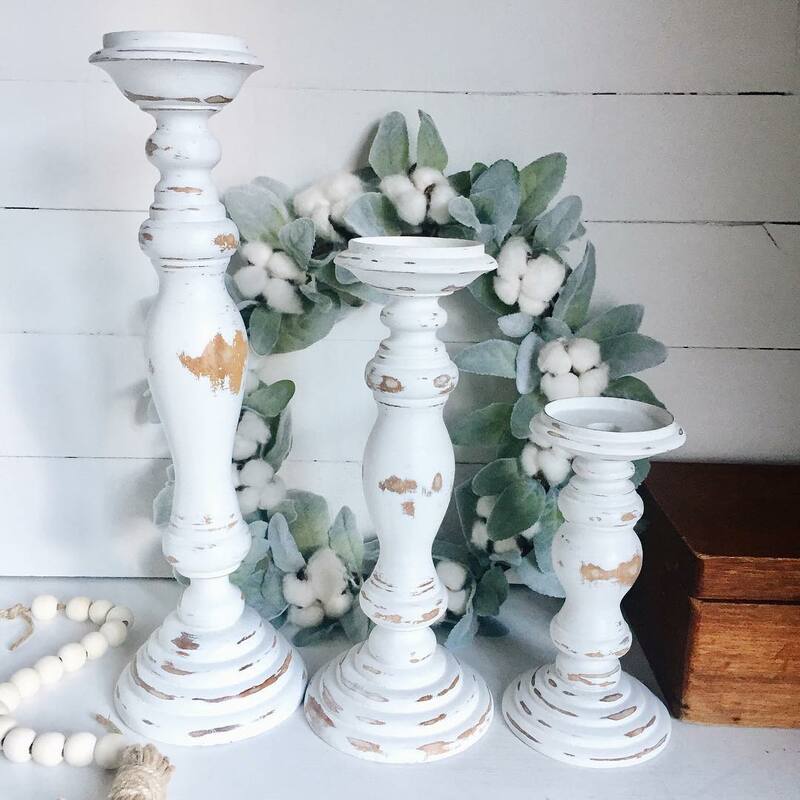 Of course, if you don’t have the patience to DIY your whitewashed furniture, then you can always shop pre-whitewashed furniture at most online retailers! Reclaimed wood accents and furniture can give your farmhouse a warm and rustic feel. Whether its a coffee table or a wall shelf, reclaimed wood is often left natural at one or more edges. The uniquely curving edges give your home a relaxed, outdoorsy vibe. Vintage looking graphic signs are an easy way to add some farmhouse charm to your walls. If you can’t make it to an antique market to get a vintage sign, then pick up a reproduction online. You can find these for almost any room in the home, but I especially see them very often in kitchens! You won’t find any stuck-up furniture in most farmhouse homes. It’s all about plush, comfortable sofa and furniture throughout the house. Sofas you can sink into, and chairs you won’t want to leave! 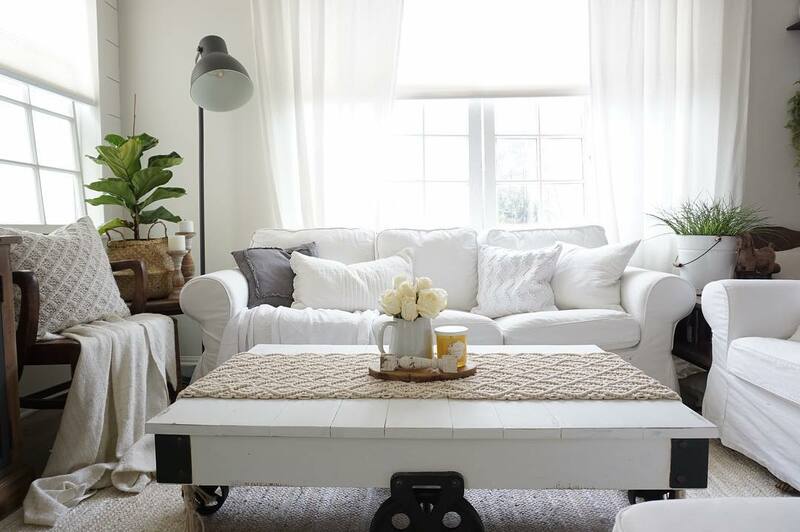 I often see white slipcover sofas in farmhouse living rooms, which are practical for working families. The floors of farmhouse homes often feature wide wooden planks finished in a warm brown color. Each wood plank should be at least 7 inches wide. You can redo your floors to get a wide plank look affordably by using inexpensive yet reliable planks like this one. Wrought iron is often present in farmhouse style homes. Joanna Gaines loves installing black wrought iron stair railings in her Fixer Upper homes. 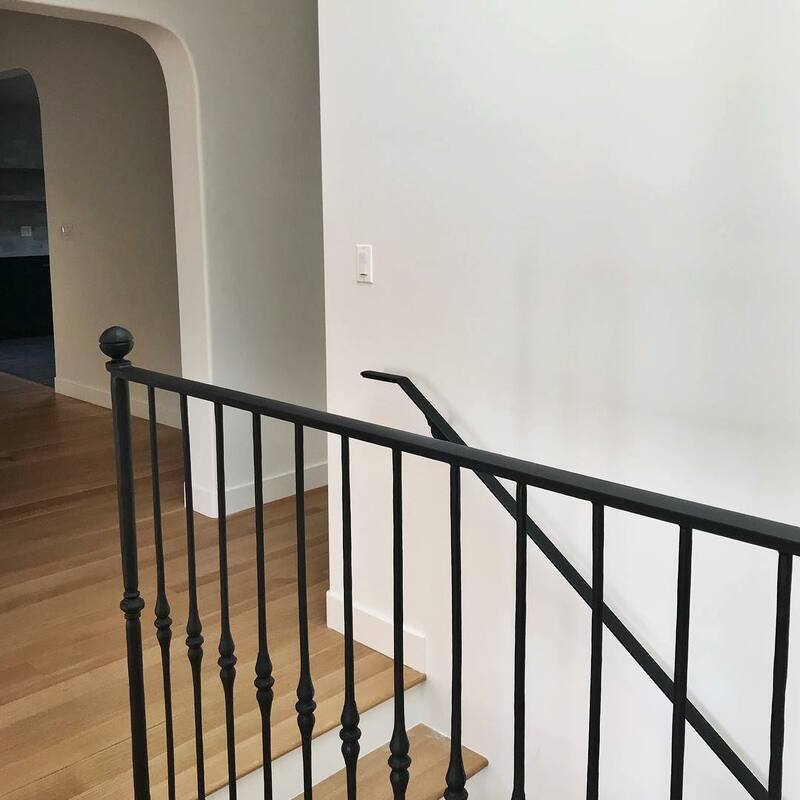 The benefit to using iron is that if you use a railing on the thinner side, you can see through it, and it doesn’t feel so bulky around your staircase. I’ve also seen beautiful wrought iron headboards in farmhouse bedrooms. Inside a farmhouse home, you’ll often find the walls painted in mainly neutral colors. Popular farmhouse paint colors include cream, vintage white, faded blue, and light gray. You’ll almost never find any bright reds or blues, or any other color on the walls of a farmhouse home. Keep it neutral! Wood beams are a great way to add some farmhouse elements to your home. They immediately add warmth to an otherwise cold, white ceiling. Many times these wood ceiling beams are purely aesthetic and are not intended to function as support for your roof at all! They simply add a rustic, warm feeling to your home. 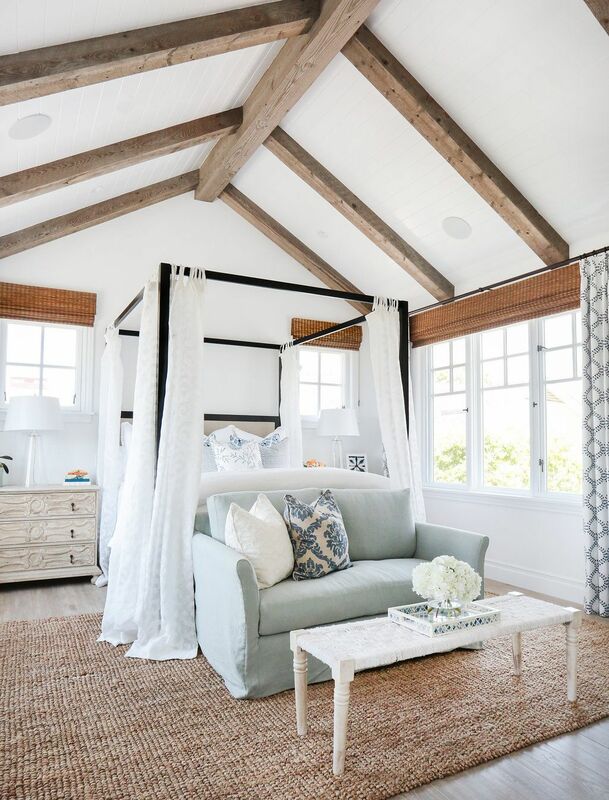 I think ceiling beams work best on vaulted ceilings in family rooms but I’ve seen them installed on standard height ceilings as well with great success. These faux wood beams come in 5 different finishes. French doors are a fantastic way to bring in more light and openness to your farmhouse home. If you aren’t familiar with French doors, they are essentially just two attached doors that open adjacent to one another. They are often used as exterior/interior doors, such as going from the living room to the back porch. I’ve also seen them used as purely interior doors as a way to separate two distinct spaces without closing them off completely. The more windows in the door, the better! A farmhouse sink is a quintessentially farmhouse choice for a farmhouse style kitchen. 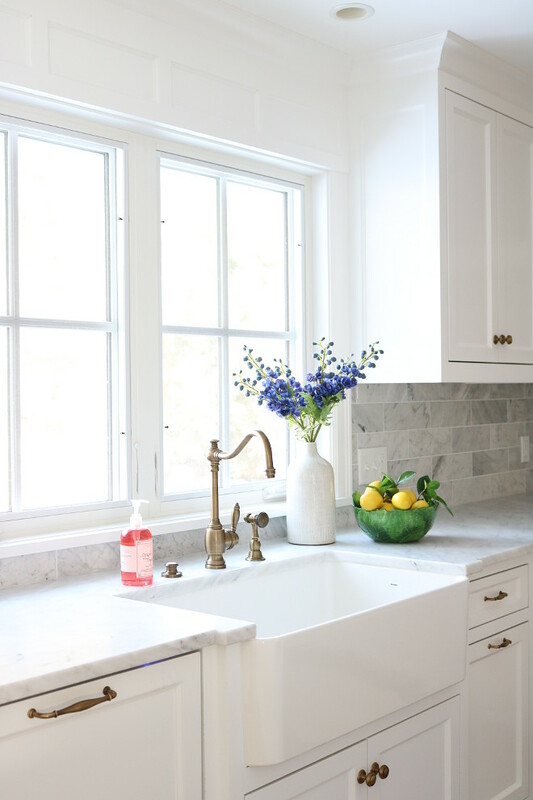 Farmhouse sinks, also called apron front sinks, are characterized by their thick barriers that stick out from the kitchen cabinets around them, and sometimes above the surrounding countertops too. They give a country home feel to your kitchen instantaneously! These days, farmhouse sinks are so popular you can find them online very easily. Be sure to read our farmhouse sink recommendations. Chalkboards are often found in Farmhouse kitchens. They are a great way to add a personal touch to your kitchen. Just make sure your practice your calligraphy, or at least your cursive handwriting! Many people choose to write the dinner menu on chalkboards but you can also write inspirational quotes or even the weekly chores on a decorative chalkboard. The possibilities are endless and chalkboards can add a delightful personal touch to your farmhouse home. I hope these ideas inspired you to decorate your home in the farmhouse style. These 15 elements of farmhouse decor should give you a great starting point, in any case! 26 Modern Brass Sconces for Every Budget!